The term "bear fruit" becomes both literal and figurative when you consider these Black Forest Gummy Bears. The bear shaped candies will produce an abundance of fruit flavor when they’re consumed, making your day tastier than the one before. But before you maul this five-pound sack by yourself, put the sleuth of soft, juicy, red, white, orange, green and yellow bears away. You’ll want to have them handy for that birthday party coming up. 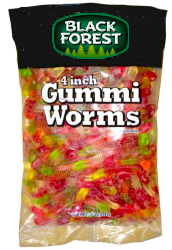 Bag contains 5 pounds of Gummi Bear Candy.